At the invitation of Bruce Stewart we are parked up at the amazing urban Marae Tapu te Ranga, a creation of Bruce and friends who built it out of recycled materials in the 1970's. 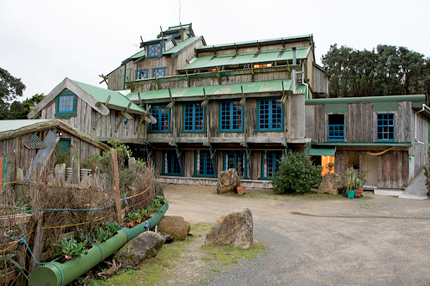 This "living marae", which can accommodate 300 people, sits on 24 hectares of land given by the Sisters of Compassion next door that is being restored to its pre-human state. It's an amazing place and Bruce is a living legend. He is still working tirelessly 16 hours a day not only on running the Marae and its humanitarian interests but also looking into new projects to bring housing and environmental restoration to the land he loves. Recently at the Ngatiawa monastery, Merlene (who has now lived at both Ngatiawa and Tapu te Ranga), presented us with a painting of the Tape te Ranga Marae by Sir Michael Fowler. Its a fabulous painting and we are looking for a way to reciprocate the gift. Which is another reason we are here. Bruce Stewart is an activist, a writer/poet and a playwright. One of his more recent poems is written about Te Raekaihau Point. I wind down the window so I can hear and smell and feel this special place where surf, sand, seagulls, and the sky play together. it is my outdoor Cathedral. So it's 2 years after the historic Protest at Tahrir Square and things are still really really dodgy in Egypt. Some great stories, but much suffering and hardship. As you probably know, we went to Cairo in 2011 during a very difficult patch for the church and were there to witness the historic all night prayer meeting with 70,000 people. We also met with Christian protestors and activists who were trying to bring peace. One of them we have been trying to get out of the country but have failed. He asked me yesterday how it was going and I told him that the immigration lawyer working on his case has left his job and there is no one to help him. I felt awful when I said that but it's the truth. Someone else will have to pick up his case and I just dont have the resources to do it. Another young Christian activist we met was almost killed a number of times recently but managed to escape the country last month. His beatings were so severe that he has fainting spells and has spent much of this week in an Asian hospital. I managed to asked an Aussie friend to spot him some money to pay his hospital bills which he did. We now owe Aus$200 and more is needed to get our friend's hospital's bills paid and for him to get to a safer country. $1500 would go a long way. If you can help, send me an email at tallskinnykiwi at gmail dot com and I will give you more details. He is still making videos to expose the corruption and brutality going on in that country, as well as the miracles of God, but I cant show you anymore until he arrives in a safe country. Here's some pictures of his injuries. Pray for him. Please. If he gets sent back to Egypt he will not live very long. You might have noticed that I have only been blogging once a week at the most and over the past year I haven't spent much time at all in the social media world. This is because we have been on the road without wifi, hanging out in a monastery, or sometimes just enjoying those REAL face to face relationships and down to earth moments like fixing our truck, taking long baths, cooking and being human. And if you get the chance, check out Frank's many books. He's a great writer and Bible teacher, as well as the co-author of Pagan Christianity. - Our son Sam gets married next month to Jenna so there is lots of preparation and planning to do. - One of our Christian Egyptian friends managed to escape into another country but the injuries he sustained from a beating last month have left a medical bill of US$600 which needs to be paid. We are hoping to get him to a European country soon. Another brother who we were trying to help leave the country is still there, much to our disappointment. - Interesting to hear Steve Chalke's announcement yesterday on the homosexual issue. I had just emailed his daughter when I read of it. - Emergence Christianity event with Phyllis Tickle sounded interesting. I must have a listen when I can. - Yesterday we recycled some doors from the toilet block into a kitchen cabinet for our truck. - More guests coming over today to camp out with us in the paddock we are in. We have two fire baths now so we can offer a nice hot soak under the stars. - I might stop over in USA on route from Europe in May, where I am speaking at Kirchentag Festival. "We can't solve hunger by throwing cans of food at people. We can't solve the homeless problem by sentencing vagrants to a life of unaffordable mortgage repayments." I said that a few months ago, as part of our Worldwide Dinner Party. But what what can we do to serve the homeless? I suggest in the New Year we rethink ministry to the homeless by taking a step closer, getting to know some homeless people as friends, not as targets of compassion. Maybe that means inviting them over for a meal or even better, get yourself invited to one of their meals. Hang out with them. Hear them out. Find out what their needs really are, not what you think they are. Here's a crazy idea: Instead of a summer holiday in a nice safe place, why not go homeless with your family for a few weeks? Go to a squat. Park at the beach. Stay in your tent. Sleep in your car. Go without showers. Turn up to church smelly and unshaven. And then try to tackle the problem of homelessness and the one billion people who live in the world's squats. Many years ago, I met a homeless guy in Portland Oregon and he became my friend. Paul had set up a tent in a large forested area near the Willamette river, about a mile away from our house in Sellwood. I invited him over for a meal but he actually didn't need food. He was quite capable of cooking for himself. Paul was a Vietnam vet and knew how to look after himself much better than I did. Food was not his problem. Neither was accommodation his problem - he was quite happy in his tent and had lived this way for a long time. But he did have some needs. Two of them, actually. Firstly, he wanted to use our washing machine. Washing clothes by hand is easy enough but when you don't want to be spotted on government land then hanging up clothes to dry can be precarious. Especially when you have a big load. So he turned up with a big bag of dirty linen and took over our laundry. Afterwards, he insisted on chopping some wood for us so we could be even, and stay even, in our mutual friendship. Secondly, and more importantly, he needed a mailing address. Could he use ours? This was more of a long term commitment but we realized how incredibly valuable it would be for him so we agreed. Whenever mail came for him, we would put it aside until he turned up, which was every few weeks. It was a great gift for him. It was something he actually needed. He never stayed for a meal. He just took his mail and asked if he could chop some more wood. That was 20 years ago when I had a house. These days, I am mostly homeless myself, with my wife and kids, as we travel from one country to the next on our itinerant mission. In the past 4 years we have spent most nights wild camping at beaches, parking lots, farms, gas stations, squats, and occasionally, when we have the money, a camping park. I have become voluntarily homeless for the sake of the gospel. But that doesnt mean there is a shortage of places to stay. Being nomadic and often homeless places me a little closer to those without shelter or the one billion people living in semi-legal or illegal temporary housing - thats one in every 7 people on the planet. I don't feel like I have all the answers but by taking living in a similar fashion, I can talk to them as one of them and we can discuss solutions together. This month we are heading up an experiment called Tent Village. We have invited people to join us in living in a paddock for a month. We managed to raise $1500 (not the $5000 we were looking for) to build an outdoor kitchen and we are about to buy the materials to construct it. If you are in New Zealand this month, come over, pitch your tent and join us in rethinking the problems of the world. 25 years ago the mission ship MV Logos hit a reef in South America. Debbie and I had been sailing on the Logos for 2 years but had left some months before the tragedy. We were deeply saddened to hear of the loss of the ship but thankful that our friends on board all got off safely and without injury. Our time on the Logos (1985-1987) was amazing, difficult, challenging, eye-opening, wonderful and unforgettable. It was also pretty intense on the tiny ship with 130 people so we kept sane by finding the weirdos and alternatives on board. Our group of crazies started an underground newspaper called "The Dukes of Logos" and we were able to keep our identity hidden because Debbie and Claire work worked in the mail room and Tom was the printer. It was quite BLOG-LIKE, actually. This is our group of crazies in 1987, after a game of "PUNK UNO", which, if my memory serves me correctly, we held in the big walk-in freezer because it was the most extreme place on the ship. I am pretty sure that this is the only photo of me taken in the 80's where I was not cross-eyed. Or maybe I was but the glasses covered up the evidence. From left, Debbie Cosper, who would marry me later that year, Freddy Kammies, Andrew Jones (me) with the life jacket, Sara Valand from Norway, Crazy Tom Seward from Winnepeg- who ended up working with Youth Specialties Mark O. [thanks Marko for the correction] and is now in North Africa, and Claire Church from Wales who we think spoke English but were never sure. Great times! I saw Tom Seward at Cornerstone 2 years ago. And most of the original Logos crew have connected with each other on Facebook. Strangely enough, this is my most active Facebook group. More of the Logos story here. Thanks Kobus for this photo of me.